As a challenge for his 40th birthday, Guy (Right) decided to join us for the 7-Day Adventure and run his first half-marathon. Rachel (one from left) signed up as well, originally to spectate, but after some thought, she chose to run the 10K event as well! 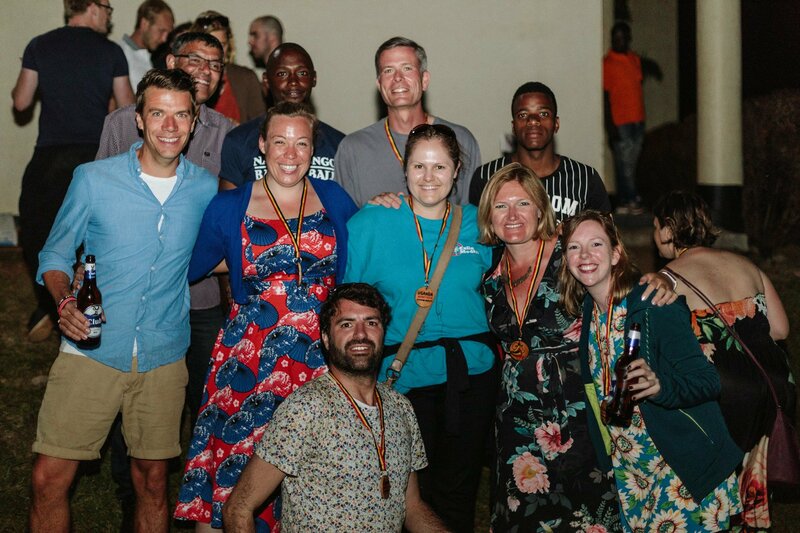 Below they give a detailed account of their time in Uganda, covering their visit to the projects, KidsRunWild, their pre-week Gorilla trek, and the community spirit of Race Day! 1. 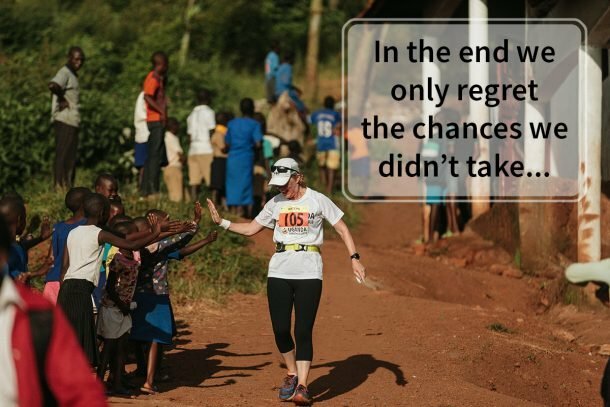 What made you both sign up for the Uganda Marathon? Rachel: It was Guy who initially discovered the Uganda Marathon and one day suddenly asked whether I was interested in going! We both love to travel and this seemed like an amazing experience to be part of. Guy had been determined to complete the half marathon as a challenge for his birthday this year but as a less enthusiastic runner, I was originally planning to volunteer and spectate on Race Day. Although I love sport, running has never been my favourite activity!! After discussion with Szilvia and some encouragement, I signed up for the 10km as I wanted to be able to support my chosen charity and knew that I’d regret not being part of the race later on. Guy: As Rachel mentions, I’d wanted to do something challenging for my 40th. I’d only run a few 10kms in the past, so thought a ½ marathon would be a good challenge. 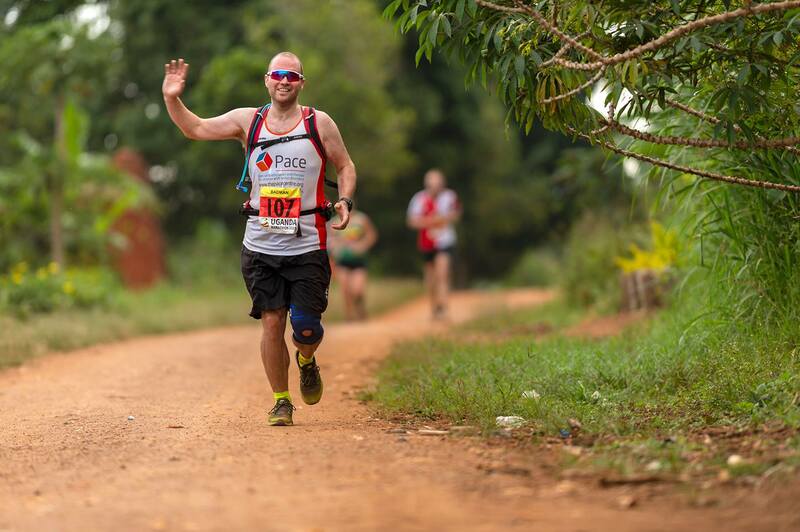 I’d found out about the Uganda Marathon at the Adventure Travel show the year before, so had it in the back of my mind. The timing hadn’t worked the previous year, but this year it fitted in well. I liked the idea of travel, doing something challenging and giving back to the local community. Rachel: I don’t think we knew what to expect to be honest! I remember getting up early for the first training run of the week and thinking afterwards “why did I sign up for this?!”. As much as you know in theory you’ll be running at altitude and there are hills, it wasn’t until we started running that you realise how much harder it’s going to be! Despite this, the race itself was incredible and I’m so glad I did it. The atmosphere was amazing and there was so much support from the local community (both those who joined in the race and those who watched us run through the town) and from other runners too. Guy: The running itself was pretty much what I expected. I primarily do trail running at home, so I am used to running on dirt tracks. 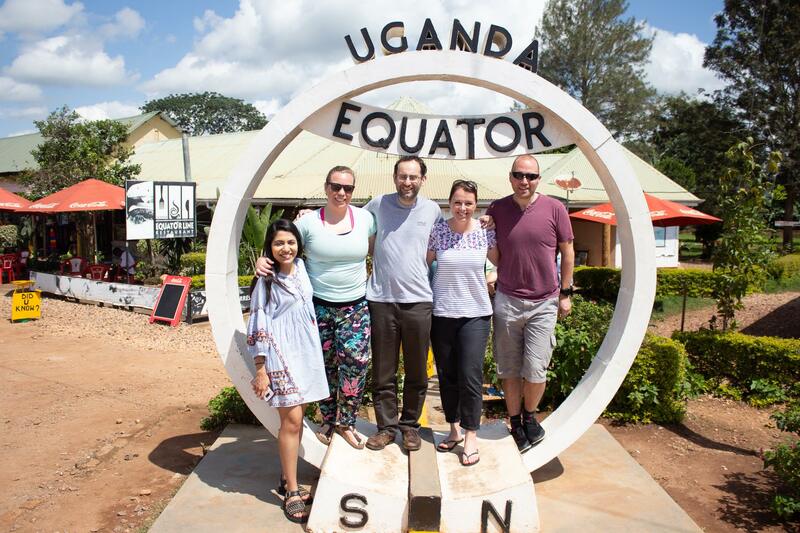 Luckily the weather back home had been very hot before heading out to Uganda, so that had got me used to the heat. Though the altitude and distance were new to me. At least I knew I’d be setting a PB for the ½ marathon, having not run one before! For the other parts of the week, I really hadn’t known what to expect. But really enjoyed it all. It’s great to get stuck in and help out in whatever way you can. Doing the training runs while there earlier in the week to get used to things were great. A highlight being running with ‘Shouty Car Man’ – that was immense!! But I’m not going to say too much to spoil the experience of that for anyone else who gets to do it in the future. I’ll just say it’s a really fun way to run through town, and a bit special to say the least. 3. Could you tell us about the volunteering days in the week, such as the Legacy Days and KidRunWild? Rachel: I chose to support and work with HURIDEM (Human Rights Defenders Makasa). I work within Criminal Justice in the UK and I felt very passionate about the work HURIDEM do challenging human rights violations and supporting victims of crimes. In 2017, Uganda Marathon runners had supported HURIDEM by building a large coop for their sustainable poultry farm. This year we built on their work by building a unit to store the eggs and keep them safe prior to being sold (trademarked as an ESU – Egg Storage Unit!). HURIDEM also took us to a local school where we worked with the children to paint signs championing human rights which were then located around the school grounds. It was amazing to meet these children and see how enthusiastic they all were about their education. The afternoon then ended with a dance competition between the children and some of the runners! One of the parts of this day that stuck with me the most was meeting some of the individuals that HURIDEM have helped and hearing their stories. This really showed how important HURIDEM are to the local community and how much positive work they have done. The other legacy day involved a trip to a local recycling centre to help build food forests. There is a lot of plastic waste in Uganda and limited opportunities to recycle it which results in the majority of this being burnt. The food forests were – in addition to providing food – a way for some of this plastic waste to be re-used for something positive. The KidsRunWild sports day was great fun and a great way to give something back to the wider community. There were various races for the children that many of the runners joined in with as well as bouncy castles and all the children were provided with a hot meal. One of my favourite memories from the day is teaching a group of children the hokey cokey! 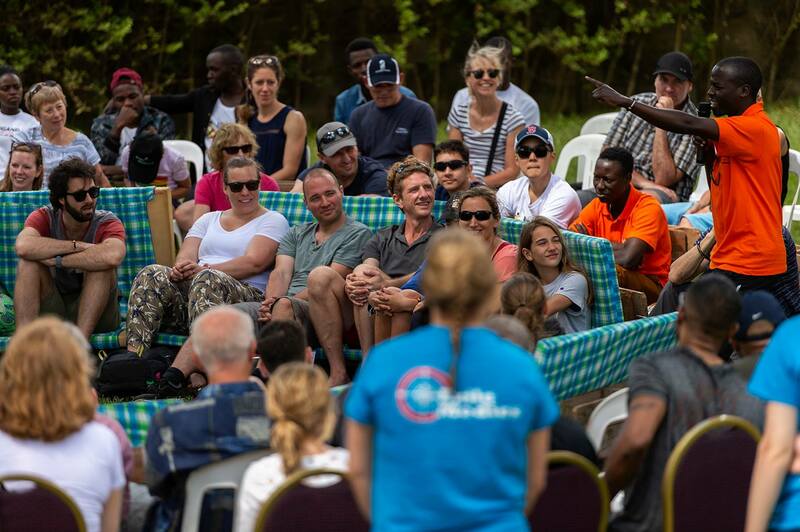 Guy: I was supporting the Kwewayo Farmers Group, unfortunately, there wasn’t enough of us for that though, so I joined my second-choice group, SCOPE, where we got to transform a large area of grass at a local school into a food forest. This was amazing, everyone worked so hard, including the whole school who came out to help – we were only expecting 10-20 of them to help us. We got loads done really quickly, it was hard, physical work, but I was expecting that. And in many ways working hard and then looking back at what you had done over the course of the day made it more rewarding. This will have a real lasting impact in the area too. 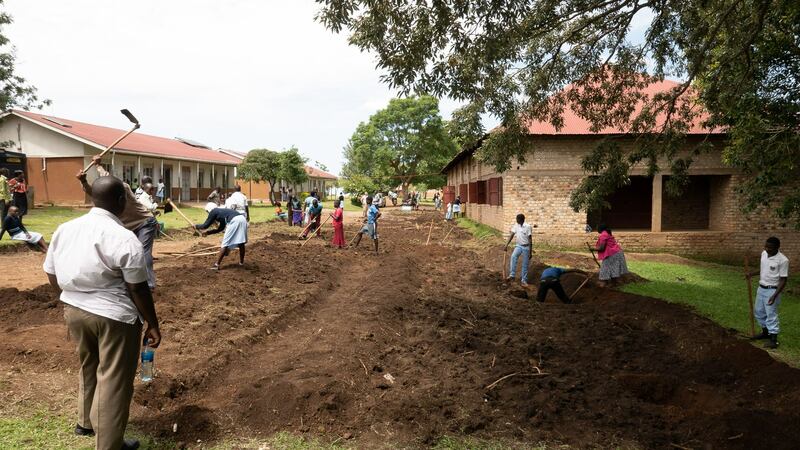 The biggest cost going to schools in Uganda is the cost of the meals, so having food on site that the schools are growing themselves should help bring down the cost, making education accessible to more children in the area. To know you are making a difference is very rewarding. 4 . Could you tell us about your experience of Race Day? For you Guy, the 21K and for you Rachel, the 10K. Rachel: Despite some apprehension about race day throughout the week, the day itself was such a fantastic experience. Granted, the 4am wake-up alarm wasn’t quite so great but once we had arrived at the start, the general positivity of everyone more than made up for it! There was a great atmosphere on the course with everyone cheering each other on and helping each other out. Despite twisting my ankle 10 minutes in, I found the run much more enjoyable then the training run at the beginning of the week had been! Seeing that some of the HURIDEM members had come to support us also provided a huge amount of encouragement and reminded me why I was there. It was also lovely to be able to cheer on other runners after I had finished my own race, and seeing some of the amazing people I had met completing their first ever marathons/half marathons was quite emotional! Guy: It was my first ½ marathon, I had a target pace and power to run to, so that I didn’t go off too fast having not run that far before. I was running with a camelback on for hydration, which I was used to running with. We’d been told to expect times 25% longer than normal race times for the same distance, but given I hadn’t run the distance before, I wasn’t sure what that would mean. I was targeting to get around between 2.5 hours and 3.5 hours. The build-up and anticipation at the start was fantastic, everyone was excited and supporting each other – having got to know one another over the week, the atmosphere for the run was fantastic. Once we got out on the run it was great to run past places we’d been earlier in the week and hear the locals cheering us on. It gives you a real push. After we’d looped out of town the heat was starting to build up. It was definitely a tough run, and bottles of water were going over my head to help cool me down. Coming back into town, the So Sure ladies lining the course and cheering us on lifted me so much when I was flagging. It was just before ‘the Beast’, so very welcome. Up ‘the Beast’, along ‘Heartbreak Ridge’ and back into town, the end seemed to come around pretty quickly. Big shout out to Lev as well – one of the Uganda Marathon volunteers who was cheering us on coming back into town – it was great to see his big smile and cheers as we came back. And then one final hill, and on to the finish. A great feeling of accomplishment! But one of the biggest highlights for me was still to come. Lining the finish funnel and cheering the others back, especially those doing the second lap to do the full marathon. Cheering them home was very emotional! 5. Prior to the week, you participated in the Gorilla Trek. Could you tell us about the experience and the highlights? Guy: It’s a long journey down from Entebbe to Mgahinga Gorilla National Park where we were hoping to see the Gorillas. But the journey down was a really nice way to meet a few other runners and start to get acclimatised for the week. The lodges we were staying in on Lake Mutanda were so lovely. 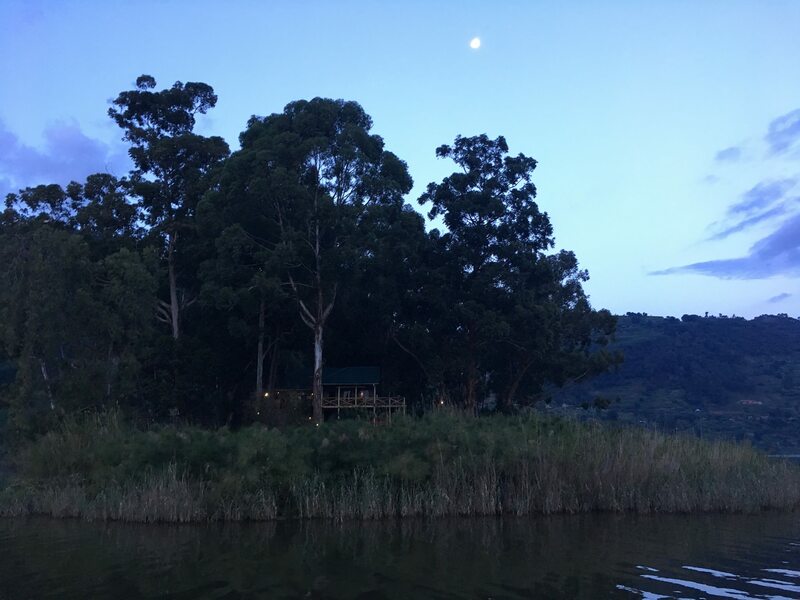 It was so tranquil and great to tell stories with the others and enjoy some sundowners, a really relaxing way to start the adventure. Climbing up to the start of the gorilla trek we really started to feel the altitude, it was quite a climb. But oh, so worth it. 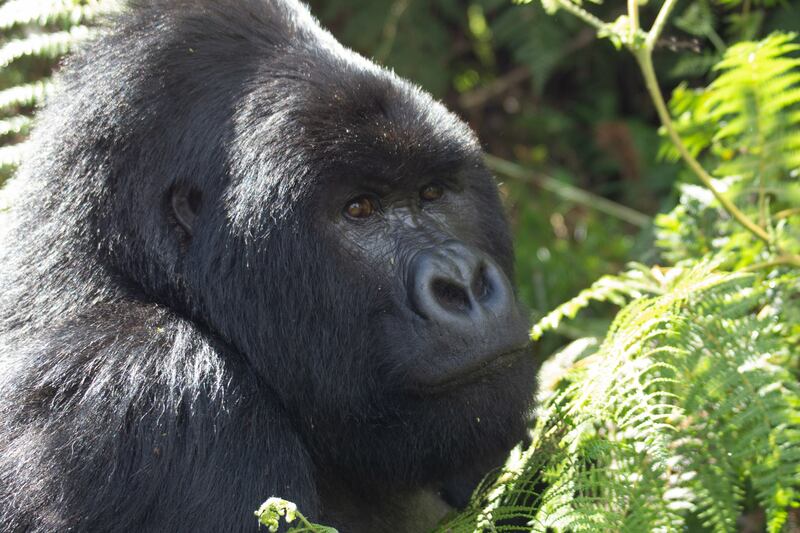 Amazingly after around an hour of trekking, we got to see 8 gorillas, and were really close to them. They were so relaxed, and really didn’t seem to care about us being there. Amos our driver for the journey was great too, so friendly and enthusiastic. It was a really good introduction to the country and people. 6. Finally, what’s your favourite memory from the Adventure? Rachel: I think for me the highlight was the run itself; the whole day was great fun and there was a sense of achievement in completing the race, especially knowing how the money raised would be helping local projects. 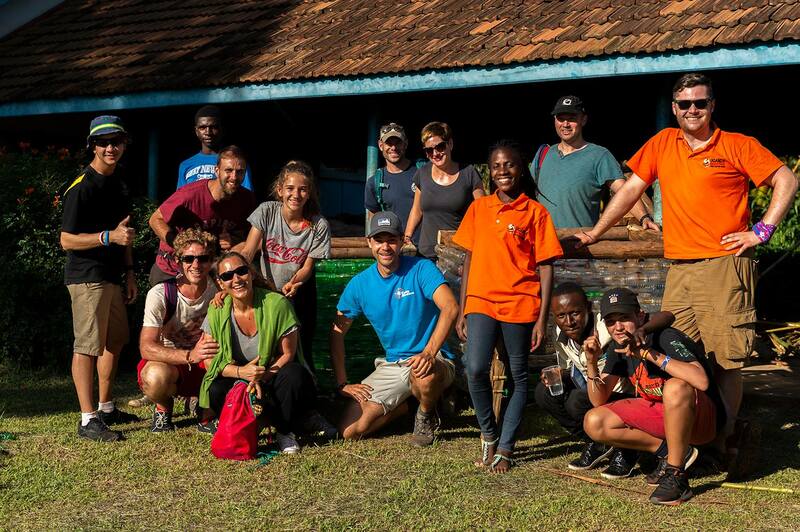 What stands out about the whole experience is the sense of community surrounding the whole week. I met some amazing people from all over the world and spent a great week getting to know them and hearing their stories. 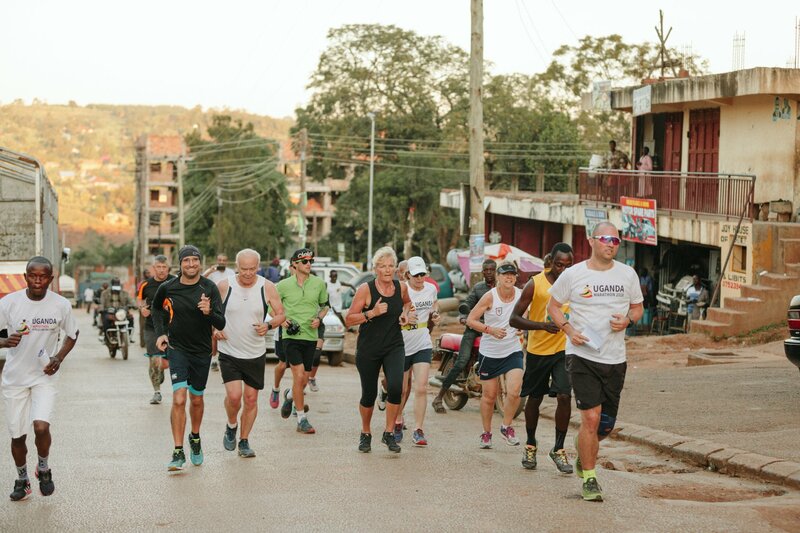 The Uganda Marathon is an opportunity to support the local community and give something back, whether you volunteer during the week, run the 10km/21km/42km, or both. It was an amazing and challenging experience and something I would recommend to anyone. Guy: Picking a single favourite memory is really difficult! There are so many. 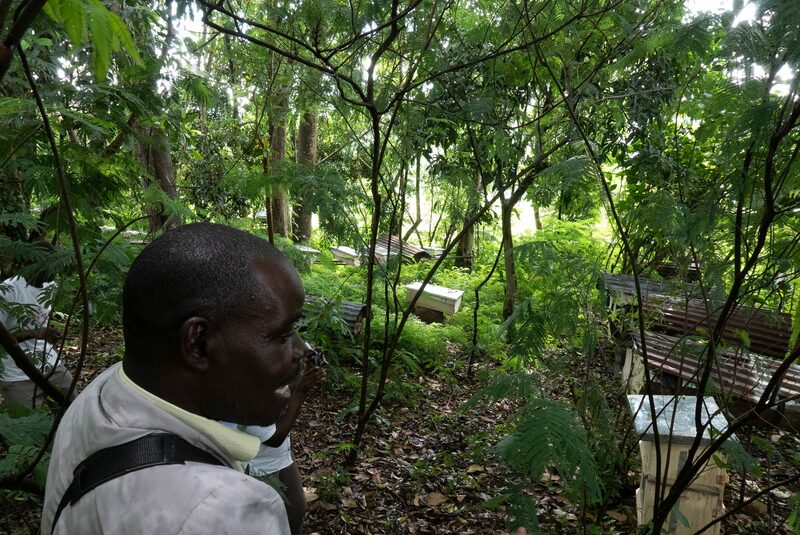 Definitely, highlights include David from the Kwewayo Farmers Group [the project Guy fundraised for] taking time out on the Friday to show us round the group’s apiary and talk us through the work they are doing. Along with what they hope to get out of the fundraising – This really spurred me on to try and raise more. Although I hadn’t got to volunteer with the project, it was amazing to go and see what they do and I was really grateful to have that opportunity. The whole sense of camaraderie from everyone involved in the week, be it the locals, the UGM volunteers or the international runners. The atmosphere and sense of fun and adventure was brilliant. Race day was so special and so emotional for so many reasons. The sense of personal achievement and being so proud of what everyone else had done as well. A big thank you to Rachel & Guy, the Glass Passport and Global View Photography for sharing these great photos with us!